This recipe has been a total inspiration for me. 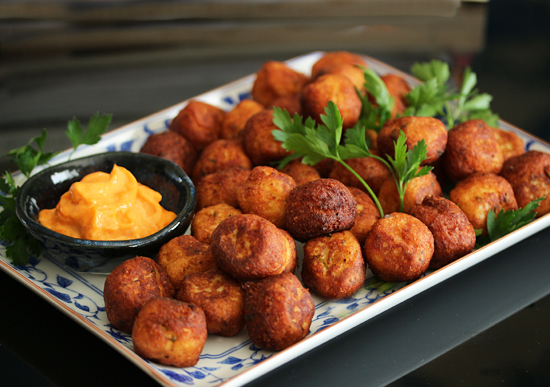 It’s little Duchesse potato bites with the spicy smokey dipping sauce would make a yummy hors d’oeuvre, but the flavor notes of Pecorino Romano cheese and smoky paprika would suggest a French or Italian menu to follow. So then I started imagining the dinner party these would headline, and how many to invite and who. I totally spaced out into lala land for about an hour. Well, you can’t have a dinner party without a plan, right? One of the nice things about this recipe is I made it from ingredients I already had on hand. I didn’t have to go out and buy anything special, just opened up my cupboard, refrigerator and freezer doors. Which means I can make more on a whim any time I get a craving. Ta da. 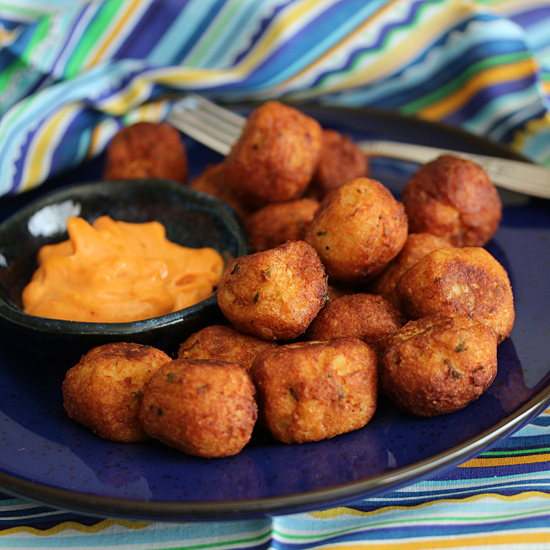 Now that I am thinking about it, you could use these potato pops as your side dish for your meat and veg dinner plate. Or with your breakfast egg and bacon. I froze my pops and they heat up in the microwave beautifully in about 30 seconds. Good as new. Truly, this is an item to make and have on hand. The mashed potato mixture, with heavy cream and eggs, is sticky. Really sticky. But I wanted smooth spheres to fry, so I covered a paper plate with plastic wrap and rolled the ice cream scooped balls around on it. They didn’t stick to the plastic, so it worked out great. I set up an assembly line to try to be as efficient as possible. While the pops were frying, I was scooping the next batch and rolling them on the plastic. I used my fingers to drop the pops in the oil, and my metal tongs worked great to turn them and remove to the paper towel. What is really interesting about this dish, for me anyway, is the combination of the Pecorino Romano cheese combined with the smoky notes of the chipotle and paprika. It makes me blink every time. A mimi surprise. So you can imagine me, standing at the kitchen counter, scooping up that orange sauce on the potato pop, tasting and blinking. Scoop. Blink. Scoop. Blink, blink. When you make these, let me know if you are blinking, too, ok? 1. Preheat oven to 400 degrees F. Poke potatoes all over with a small knife and bake on oven rack for 60-75 minutes until very soft when squeezed. 2. When cool enough to handle, cut in half and scoop potato flesh into a large bowl. Discard skins or, as I did, eat them with cold butter while you finish making the pops. 3. Mash potatoes and sprinkle with bread crumbs, garlic powder, black pepper, salt and cheese. Fold in thoroughly to combine. 4. In a medium bowl, whisk eggs until blended. Add cream, yogurt and butter, and whisk to combine. Pour over potatoes and mix with a fork to incorporate. 5. Cover a paper plate with plastic wrap. Cover second paper plate with folded paper towel. Pour ½ inch oil into medium skillet and heat over medium heat. 6. 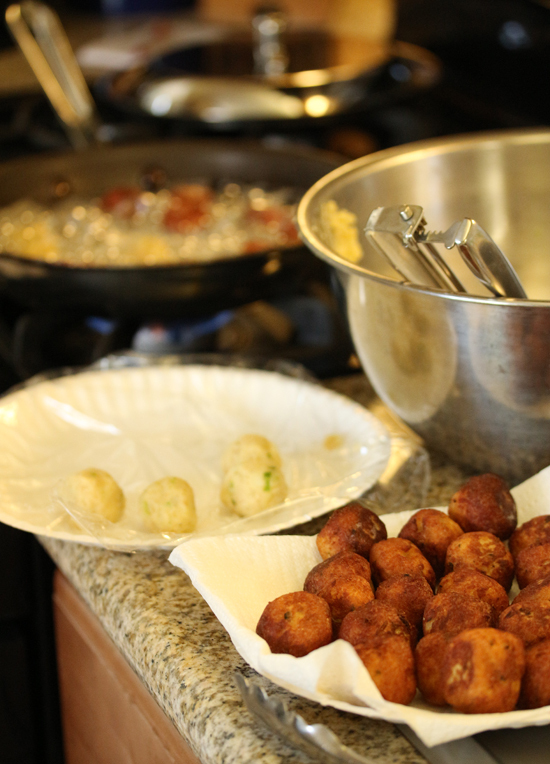 Using a 1-tablespoon ice cream scoop, make balls of potato mixture. Roll on plastic-lined plate to make round and smooth surface. The potato mixture is really sticky, but will not stick to the plastic. 7. 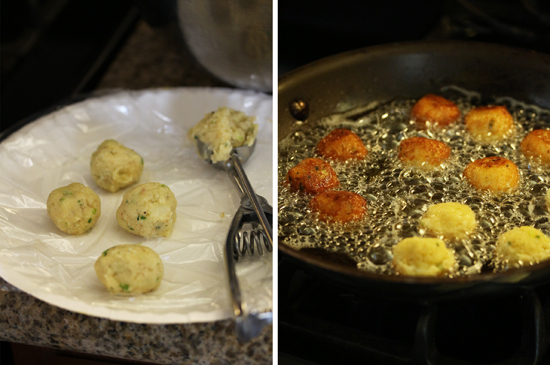 When a small piece of potato mixture sizzles when dropped in oil, add enough potato balls so they are 1 inch apart. Fry pops until deep golden brown, about 3 minutes per side. Using tongs, place on paper towel lined plate to drain. Continue in batches with remainder of potato mixture. 8. 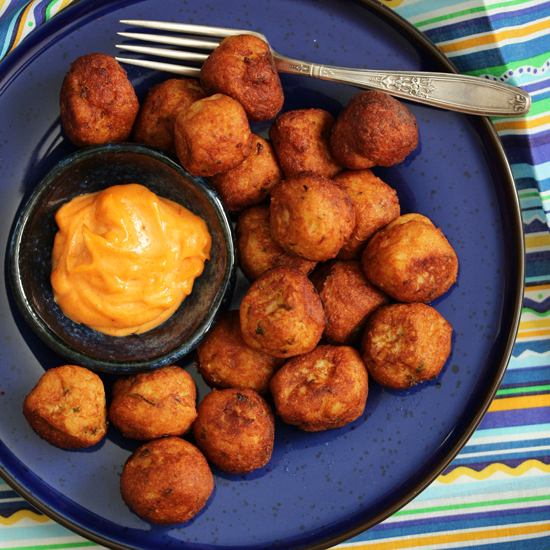 Serve with Smokey Chipotle Sauce. Note: I dipped these in ketchup and they were marvelous. I froze my potato pops in a large plastic ziptop bag and they microwave beautifully in about 30 seconds. I plan to try other dipping sauces as they appear in my kitchen. 1. Whisk sauce ingredients together in a bowl. Can be made 1 week in advance, covered and chilled. I could just dive into a plate of those right now! Looks delicious. I hope I was one of the imaginary guests for your party. I would’ve loved being there!